We’ve seen it happen at New York a couple of times, and Paris, but now it has extended to Japan. The trend of diversifying beauty and showcasing it on the fashion runway seems to be going global, and that is a good thing! 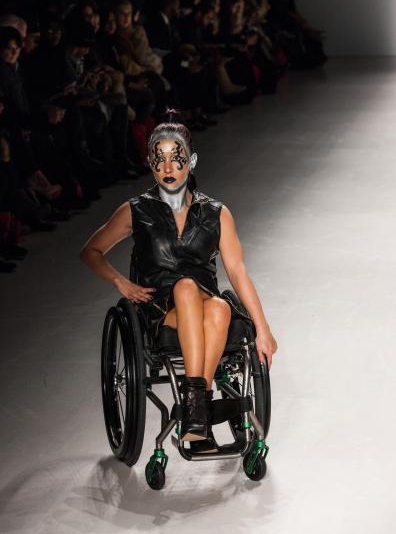 At the most recent NYFW, we saw designer Carrie Hammer use disabled models as well as female CEOs instead of the regular round of models for her show ‘Role Models not Runway Models‘. The most prominent person who was talked about in the media was ‘American Horror Story’ actress Jamie Brewer who just happens to have down syndrome. It was the first time anyone had seen someone like her walk down a regular runway show, and it was awesome! Carrie Hammer got more press than Kanye West that week! 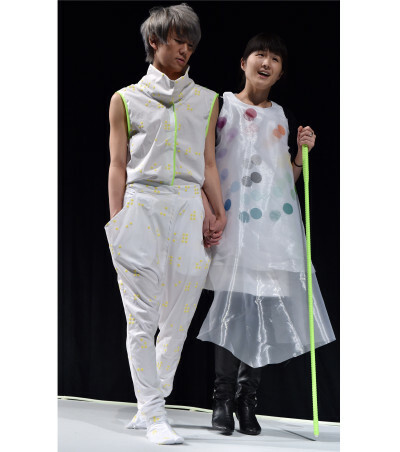 Over the other side of the world toward the end of March, Tokyo Fashion Week was being held and it was business as usual, until designer Takafumi Tsuruta’s show hit the runway. Looking to capitalize on the trend of extending the narrow ideal of beauty on such a huge platform, he had a model who was blind, an amputee, and a model in a wheelchair strut their stuff on the runway. His show has been described as “unorthodox” for using a mix of disabled and able-bodied models. We’re not sure we agree with that statement, as it could be tokenizing what he is trying to make normal. From our POV it is super important that he has place both types of models alongside each other to show there shouldn’t be any division amongst body types in fashion, we are all different and that should be celebrated collectively. “We are introducing something called ‘people’s design’. The clothes are aimed at everyone in the world. I think it’s fashion’s responsibility to have trendy and easy-to-wear clothing,” Takafumi said in a statement. Part of his stylish line-up included model Amy Sano who was born with a rare condition where she didn’t develop any limbs except a left foot. Modeling a wedding dress at a major fashion week show was something she never would’ve dreamed of, she said. She said “there is still a wall” in Japan between those with and those without disabilities but she thought the show could help to challenge prejudice. “I would like people to keep having hope,” she said. 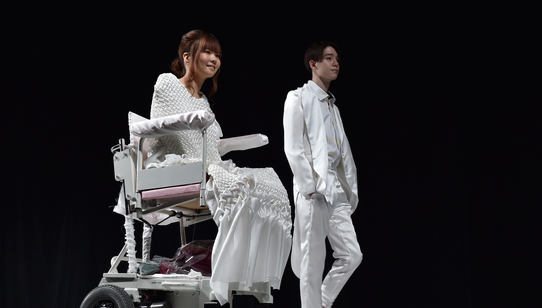 Opening the show was blind model Rina Akiyama, 27, who won gold swimming at the London 2012 Paralympics and works at a pharmaceuticals company. She who wore a dotted trapeze dress inspired by Braille and said it was “very rare” for such a fashion event in Japan. “I think there are a considerable number of disabled people who don’t leave their homes. It would be great if chances like today increase,” she added. Paralympic Snowboarder Mika Abe was also part of the show which has no doubt made a statement in the eyes of the Japanese. Let’s not lose sight of why these fashion shows are important. Yes, it is about extending the definition of beauty to include all bodies, but it is also about raising awareness about certain disabilities. The second label which made a splash featuring disabled models at NYFW was Italian brand FTL Moda. Featured in the ‘Loving You’ show was model, activist and motivational speaker Tamara Mena, who became paralyzed and suffered from spinal chord injury after a horrific car accident. The 28 year old California gal was traveling with her boyfriend in a taxi in 2005 down a deserted and dark country road at night when they collided with a stray horse. Her boyfriends tragically died, as did the taxi driver. Mena is using her story to inspire others because she believes she is a survivor, not a victim. After graduating from college her mission was to further her experience and inspire young women not to give up when the going gets tough, and her motivational speaking and activist career landed her a starring role at NYFW 2015. But it didn’t stop there. To raise awareness about spinal chord injury and the millions of people who are dependent on a wheelchair because of this type of injury, Tamara is now teaming up with Wings For Life who are a non-profit organization that do clinical trials for spinal chord injuries. At the beginning of May the org is looking to raise funds by holding the Wings For Life World Run in 35 locations around the globe. They are teaming up with action sports brand Red Bull to increase visibility about this event. As an ambassador for the organization Tamara will be taking part in the event to raise awareness. “I’m passionate about making a difference and leaving a mark in this world. As a person living with a spinal cord injury, I’m very thankful that something of this magnitude is being done to support research. Being a Wings for Life World Run Ambassador with the ability to share this message in both English and Spanish means the world to me. I have a passion to use my voice to make a difference, especially after losing the ability to communicate for two months after my accident,” she said in a statement. Tamara is originally from Leon, Mexico and now resides in the US. It is estimated that the leading causes of spinal chord injuries are car accidents and falls. There is no cure for SPI’s, but in the meantime what Tamara is doing is expanding the definition of beauty as well as the word “able”. “To really live my life as a survivor, it was important for me to understand that my wheelchair was part of me. No matter what trials and tribulations I face, no matter how many times I fall down I always get back up. If you let yourself grow you’ll be surprised as to what you can accomplish,” says Tamara in the Wings For Life video below. We love seeing people who are using what the world considers as “disabilities” to empower and enable many other people who need to know that just because you suffer through something, doesn’t mean you have to be a victim. We are all more than conquerors when we choose to look at ourselves as survivors and ambassadors, whether on the fashion runways of the world, or in every day life.